We’ve often been told that ‘organisation is the key to success’. Never has this been truer than for the modern kitchen with its diverse ingredients and a gadget for everything. How did decluttering go from being a simple spring chore to a science? Now there are businesses, professionals and consultants who can teach us a whole new way of living – sans the clutter. Some have written best-selling books and achieved cult status. But when it comes to the kitchen, we’ve got used to an array of gadgets, cutlery and single-purpose products. So, how do we bring order to the chaos? Here are a few tips to keep the kitchen organised and easy to use. In a kitchen, the pantry, cupboards for crockery, the dinner sets and the wine glasses are all built into the design. But rarely do people think of a permanent place for the collection of little electrical gadgets we all acquire over time – the coffee machine, the sandwich toaster, the blender…the list goes on. We’ve been designing kitchens for close to 50 years and we are seeing how gadget storage is getting as important as the pantry. The best way to organise them is to have a dedicated cabinet equipped with a few power points. It can be a shallow cupboard, built at the end of the benchtop. All you need to do is to pull out the appliance on the bench, use it and slide it back. Shut the cupboard doors and you’ve got a clean, uncluttered look. The heavier, frequently used appliances should be on the bottom shelf, with lighter ones and least used ones on the higher shelves. Here’s one we did for a customer who wanted to have all their appliances neatly stowed. By putting the appliances behind doors and onto shelves, your entire kitchen benchtop will be left clear for food prep. It’s safer to have electricals inside shelves when not in use to prevent accidents, especially if you have young children. You may actually use your appliances more if they are easily accessible. 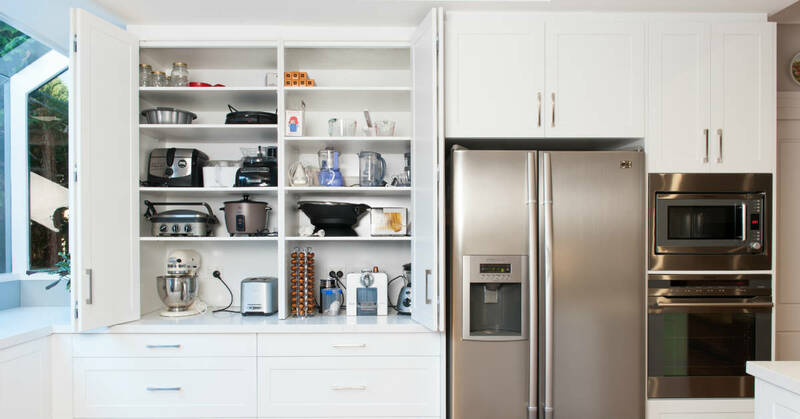 Before designing a kitchen, it is a good idea to think through your food storage needs and how you can best store the 100’s of ingredients that comprise the modern kitchen. A well organised pantry: Every kitchen needs a good pantry. 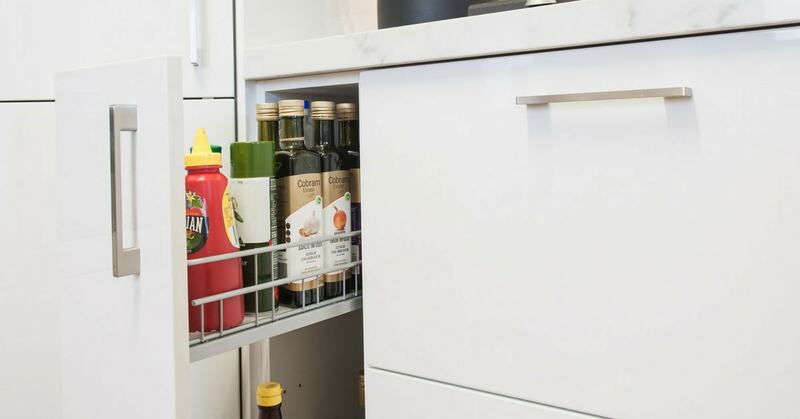 A large walk in pantry is ideal, but if that’s not possible, you can explore a combination of a pull-out pantry and pull-out trays in the base cabinetry for additional storage. The large walk-in pantry can very quickly descend into a mass of disorganised food ingredients. You can use a combination of stackers, can holders, box holders and clear storage with labels. Put all similar ingredients in one section of the pantry. With the pull-out pantry, organising the shelves by use will keep things easy to find. This is a large pull-out we did for a customer recently. 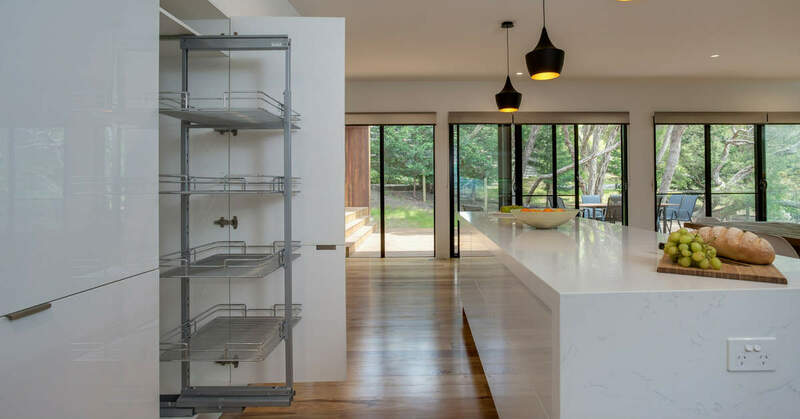 The base cabinetry on the other hand, can benefit from pull out trays, dividers to segment products – example – baking ingredients, spices, tinned food etc. Here is a pull-out spice rack positioned just under the stove top. It’s very easy to get ingredients as you cook and put them away. It’s a bit of a mystery why the simple turntable is called Lazy Suzan, but we think she’s quite intelligent for turning dark, hard to reach corners into accessible storage space. 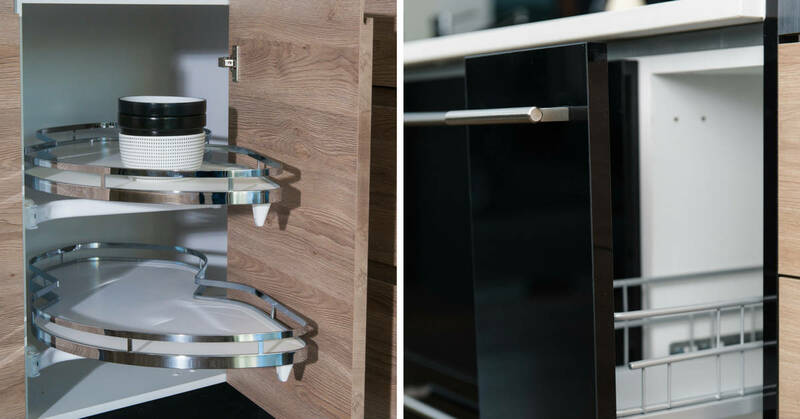 It’s one of those simple solutions that has been adapted into servery for dining tables, nibbles and even office supplies. They come in every conceivable material – timber, plastic and glass. At Zesta Kitchens we use one that is very stylish. Under sink shelving: In most kitchens, it either becomes wasted space or a dump for cleaning rags, bottles, sprays and plastic grocery bags. Use it for a good quality double bin rubbish system that will slide smoothly and allow you to segregate waste easily. 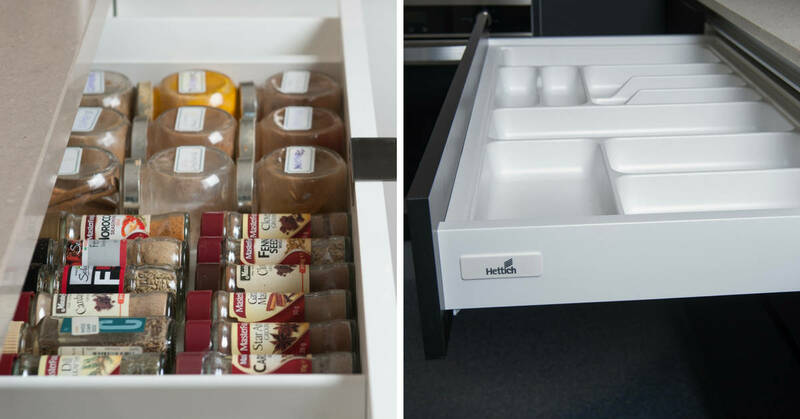 We firmly believe in that putting in dividers, inserts into large drawers, cabinets can help control the clutter of small kitchen implement, cutlery and gadgets. Here are a couple of examples. The cutlery drawer not only looks organised, but you won’t have to dig to find the fish slice or the bread knife. Same with the spice jars. Labelling them not just with the name but expiry date will tell you exactly when it’s time to pitch it out. Having an organised kitchen is easy to achieve if the right storage solutions are added at the time of designing the kitchen. Make organisation a priority and add in shelving solutions to achieve a clutter-free look. If you are considering buying a new kitchen with perfectly designed storage solutions, our designers have a lot of product know-how, so walk into one of our kitchen showrooms and book an in-home consultation.